In the MACEB project the information on black carbon emissions from different source categories and areas (e.g. Finland) is integrated to black carbon concentrations in surface and snow over Arctic areas and further with corresponding radiative forcing. 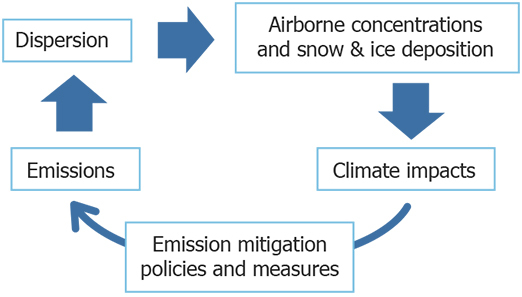 The method used in this project combines information from global (GAINS) and national (Finland, FRES) emission models, global (ECHAM5-HAM) atmospheric model, and actual measurements of black carbon concentrations in surface air and snow.